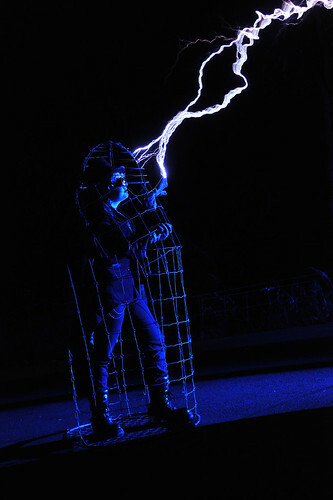 Because our 2010 venue is a former power station, we felt a theme of electricity was the most obvious choice - and what better way to do it than with REAL lightning, conjured up just for our use? 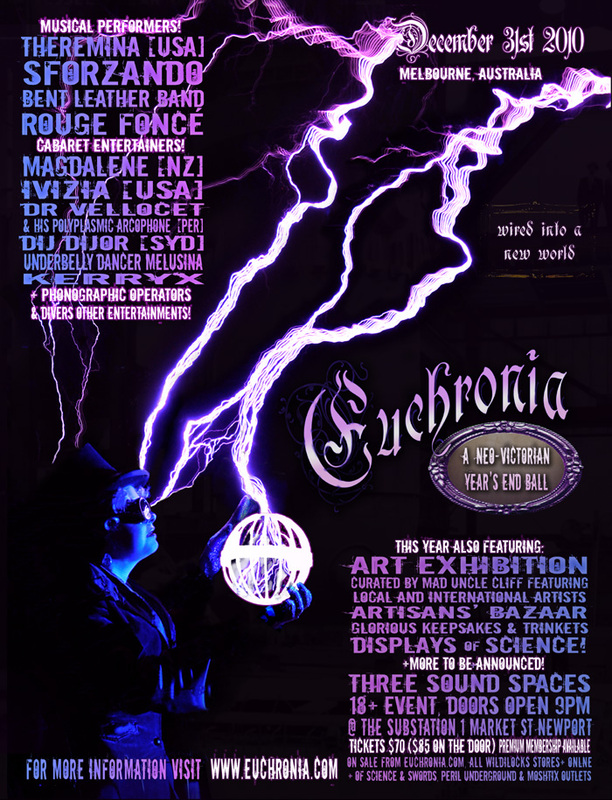 While many may have assumed that the lightning in the image is solely the result of some clever Photoshop - (and yes, our first teaser flyer was indeed all digital) - while there may have been a little bit of image manipulation involved - the reality is, our lovely model Helen was in fact actually being shot with real lightning bolts from a very impressive 2 meter tall Tesla coil! 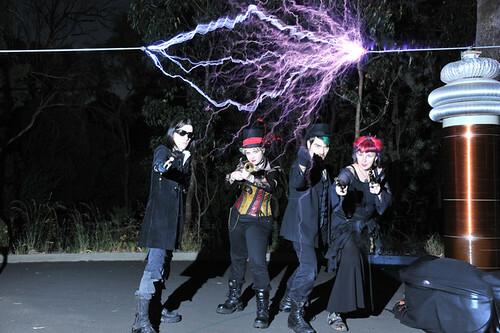 In fact we believe we are the first steampunk group to have had a genuine Tesla coil photoshoot and this is something we're very proud of! 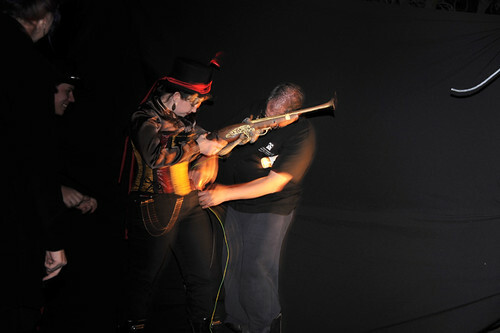 To get a bit of an idea of what the shoot looked like, check out the animated gif put together by Peter Terren, as above. If you'd just like to see some of the behind the scenes images, you can check out our Flickr set here or Peter Terren's very comprehensive set of images and amusing back-story here. 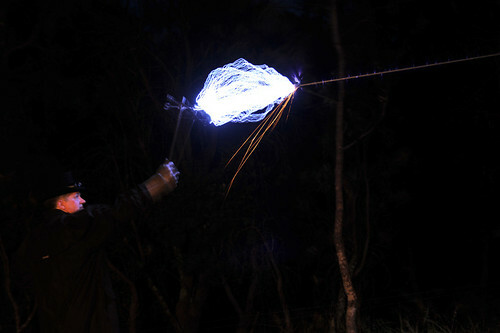 Of course the star of the show was Peter Terren of tesladownunder.com and his pride and joy, his Tesla Coil. 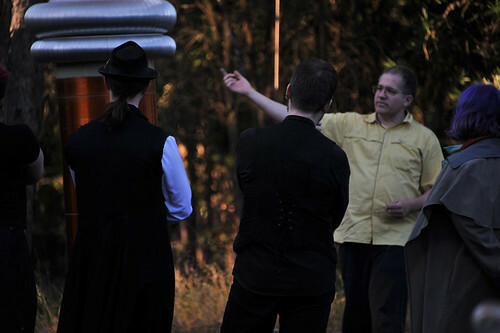 Peter's Tesla coil adventures have been featured on TV and in print extensively all over the world, and you have almost certainly seen some of his images online, most likely at the very least his version of "The Thinker" - his website documents all his shoots and he's done some fantastic images. 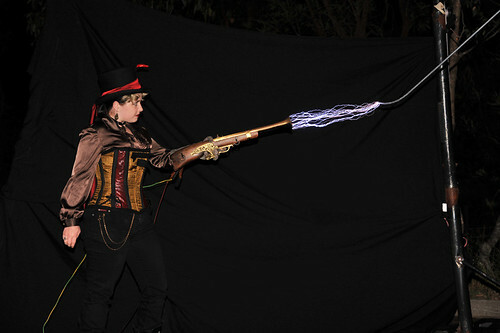 Now, working with Tesla coils involves an inherent risk of injury or death - this is high voltage stuff and not for the fainthearted! Fortunately, Peter set us all at ease by trying everything himself before he put any of our models in the firing line, so we were relatively reassured. While we had a battery of cameras set up for the shoot (4 cameras in total) the photographer we employed specifically for the shoot was Perth photographer and tree-lover, Nonie Jekabsons, who is more likely to be found photographing more natural subject matter (her RedBubble is here). This was our first shoot with Nonie, and it went very very well. Nonie used two cameras to make sure there was a good range of images to choose from, and with Peter's and Ian's cameras as well, we had a lot of backups! 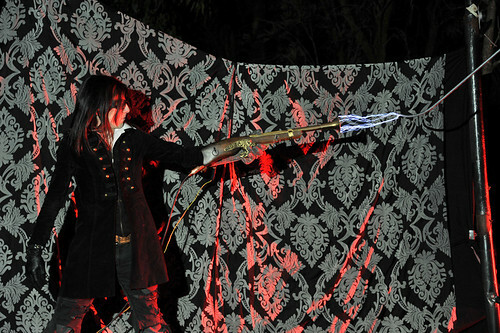 We had several models for the shoot, including Christoper, Ian, Jeremy & Cass, as well as Chris and Peter, and of course Helen, a bastion of the fledgling Perth steampunk scene, who makes wonderful steampunk artifacts that you can find on her website, Dark Nouveau. But in the end, the image of Helen with the Faraday cage won out, with intense blue light from Peter's brightest bike light in the world. 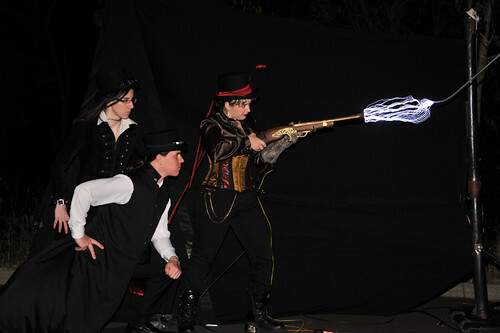 Clothing featured a gorgeous Nubia/Vodabox coat, top hat and the ubiquitous steampunk goggles all available from Wildilocks. It was a very exciting and rewarding evening, and thanks so much to everyone who was involved, especially Peter and his lovely wife Jane for showing us such wonderful hospitality! 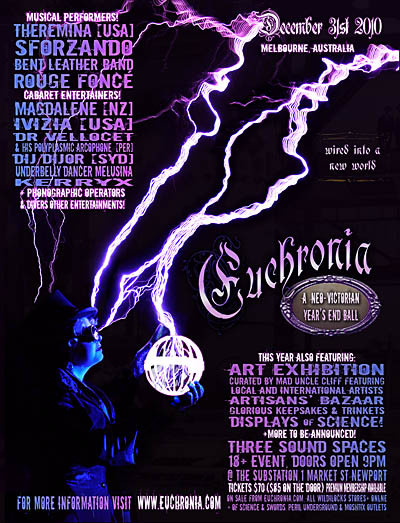 Just a last note: if you don't have your Euchronia tickets yet, check the euchronia.com Tickets page for all details on how and where to get them either online or in person!